"Train Explosively and Work On Your Lockouts With Powerlifing Bench Press Bands"
In the case of bands, the weight constantly increases throughout the concentric movement, sometimes called 'accommodating resistance.' Bands make the eccentric portion of the lift considerably harder as well, and are great tools for learning speed and acceleration, maybe through a sticking point in your lift, or just to increase your starting strength or lockout ability. Bands are extremely useful for powerlifting competitors who use bench shirts, since the lockout is then the hardest part of the lift, and bands increase the ability to lockout. Some powerlifters train their chest once per week, and others train the chest twice per week. If you train your chest twice a week you will use the bands during your light training day of the week. If you lift chest once a week, use the bands on a session that would have been reserved for a light day. On the day you train with the Powerlifting Bands you want to concentrate on explosive movements with aprox. 55-65% of your one rep max weight. Your goal is to concentrate on the speed of movement to build explosiveness. We recommend that you set yourself up in a half rack or full cage with adjustable pins or bar supports. Set up like you would normally for the bench press and position the pins at the lowest position. Although many powerlifters use bands for their speed days, many university athletic teams have used the bands to train with 87-88% of the athelete's one rep max with extraordinary results. During your reps you will feel like the weight is both light and heavy at the same time, but it will occur at different points in the lift. You must focus on giving each rep an explosive, very intense push from start all the way to the finish. The bands will help you with the explosion from your chest as well as aide in the lockout segment of the bench press. The lockout is the weak point for many benchers and we all know we need to work on our weak points to make gains. Do 10 sets of 3 reps with 60 to 90 seconds ret between. Weight Lifting Bands, Powerlifting Bands come in 5 different resistances. Use 1 resistance or use combinations for EXCELLENT workouts. Great for all pulling and pushing movements when you lift. A large percentage of the people reading this will have never even tried bands nor seen their use in real life. To say that bands are one of the big reasons power lifting records today up are being smashed is an understatement. Westside barbell has brought band use to the cutting edge of power lifting technology. Bodybuilders for the most part have been slow to catch on but that trend is now changing as more and more people come to realize the advantages the bands use can provide in their daily training from both a size and strength standpoint. What do these things possibly do for your training? Well the bands accommodate resistance. What this means is that where you are weakest, generally in the bottom position the bands are weakest. As you expand through the motion in the bands pickup tension and thus resistance. Using the bench press as an example by looping the bands over the bar you will have increased tension at the bottom of the lift, and as you extend towards the contracted position as your body's natural a strength curve takes up so does the band tension. This provides more work during the complete of range of motion. Not only that, it teaches you to be fast with the bar because if you are not fast in starting the motion you will never reach full lock-out. What does this have to do with bodybuilders who are not interested in maximal strength training? Gee, I wonder, no one here is interested in 50 to 75 pounds more on their bench or a hundred to one hundred-fifty pounds on their squat or deadlift are they? The bands have been used in power lifting for over 10 years now and are part of the reason the records continue to be smashed. Initially they were primarily used on the big lifts like squats bench presses in deadlifts, but as many people started to see all the advantages, their use has expanded to many lifts including lifts were the bands are the source of all the tension used for the lift. 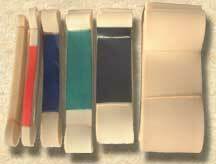 I had been using the bands for many years, primarily for benching and squatting. When I recently moved and bought a new house on five acres I realized I would have to wait until spring to have a garage built for the gym. Moving everything into the house was a necessity but realistically there was just not enough room for my pulley setup. What to do? I decided to get creative with the band use to substitute some of the moves that I used to do with the pulleys. I had known for years at many lifters use the bands for these moves that had never taken the time to experiment to any great extent. WOW! I sure had been missing a lot a very productive moves and can say with full confidence that the bands are not only an alternative replacement for many conventional pulley and free weight moves, but are an improvement to many of them? BS you say? Well I know you are not speaking from experience because the bands really do provide a better strength resistance curve for many, many moves. This article will cover some of these moves but will not be comprehensive because I can say with full certainty that if you are reasonably creative you will constantly find more and varied ways to do things with the bands. I know I continue to do so, and are willing to bet if you take the time to invest in a set of bands you'll find many productive things to do with them that are not listed here. A couple of things to keep in mind to keep in mind since there are only so many band sizes available people think that being progressive without making huge jumps is an impossibility that is just not the case. There are many means of increasing the tension on the bands without necessarily going to the next size band. As in example 1 of my favorite and exercises are upright rows. Because of wrist and shoulder problems I absolutely cannot do upright rows with free weights. However by using the bands they are totally comfortable on both the writs and shoulders and allow me to go heavy on a consistent basis. But as an example let's say I'm using a number four band for upright rows and got three sets of 10 last week. Many people would say OK now what? Going to a number five will probably allow zero reps to be done. But please understand when doing upright rows you are standing on the bands to anchor them in the bottom position. By merely spreading your feet out a little bit you increase the ban tension. Now that is not as precise as going from 155 to 160 with the barbell set. But as long as you're consistently getting bigger and stronger do you really care? My guess is no. This is just one example and with some creativity you will find that almost all the lifts done with bands are able to be done on a progressive basis by various means of increasing band tension. OK here goes head to toe band use! For working your neck, choke a band around the power rack up right. You can work front, back, and sides this way. Beware that if you have hair it can be rough on it, so a hat or towel in between the band and you head is a good idea. I shave my head every day so it's not a problem-lol. The wider the band the more support you get and it's simple enough to decrease the tension by just moving in a bit closer. For traps perhaps the best way to implement the bands is when deadlifting. another way to use the bands for traps is to set the bar in the power-rack at just below the level you began a shrug at. Loop the bands over the bar and shrug away. This can be done with just ban tension alone or a combination of band tension and free weights. Another great shoulder builder is upright rows. But..for many people, myself included, the fixed hand spacing on the bar is hell on both the rotator cuffs and wrists. Enter band upright rows. Because you hold on to the flexible band instead of a fixed barbell shoulder stress is reduced---a LOT, wrist stress too! Performance is basically the same as for the laterals as far as where to lock the bottom of the bands, the big difference being wrist/forearm position. This is another GREAT move to provide variation from either regular upright rows, or just allowing those that have shoulder/wrist problems from doing bar rows to be able to do a rowing movement. The recruitment pattern is different enough from bar rows to stimulate new gains if you have stalled on rows. And again, the resistance curve with the bands is much closer to your body's natural strength curve. A set of # 2's or a #3 or #4 is the right choice for most people for this movement. The last move needs to be approached with caution, and I will recommend most use part bands, part weigh instead of all band tension. You can use the bands for military presses if you put a seated bench in front of the power rack, and set the safety bars at chin level. Put a barbell on the safety bars and take one end of the bands and loop them over a dumbbell heavy enough to keep the dumbbell on the floor, and place the other end of the bands over the bar. Now add plates and your band of choice. Start the movement from the bottom and it will beat your delts HARD. The reason this move needs to be treated carefully is the bands can be hard on the joints and many people can move some serious weight/band tension on this lift, so make sure band tension isn't too high, and cycle this lift in and out of your training. Moving along to triceps, I would just say the first time you do a set of triceps push-down using the bands you will likely not want to go back to using a pulley system for them. Where you are weak the bands are weak, where you are strong that the end of the position, the bands are strong. And like all band work they really force you into fighting the negative portion of the movement. Talk about torching triceps! You can just hold on to the bands doing these, or loop them around a variety of tricep bars. Switch bars frequently for variation and to reduce getting "stuck" with your poundage's. This movement helps my bench a LOT. Because the nature of laying triceps extensions being pretty hard on the elbows, I won't recommend anyone but those with the most robust joints do them with bands. But they can be done by starting them of the pins in the power rack. What the bands are made for! Double a set of bands around a heavy dumbbell (you will know if it's too light as the bands will pick it off the floor if it is!) and loop them over the bar. Bench away! You can also do close grip reverse benches. A move often done in the smith machine. The bands somewhat lock the groove the bar takes and makes this lift doable with free weights. Dips fall into triceps and chest work, but I'll cover them here. The bands can be used BOTH ways here. Meaning you can run them over the TOP of the dip bars and put your feet on the bands to reduce bodyweight. Too weak to do many bodyweight dips? Use the bands and dip away. Conversely, you can run a band thru a dumbbell and over you neck and ADD tension. AWESOME way to do weighted dips! Chest work..geez, where to begin? As already stated with close grip bench press, the classic band movement for chest is done as listed above. You can do these with various band tension from very light, to 75% band tension. But beware, going to high with band tension and not enough weight to stabilize the bar and you will be thrown all over the place and it becomes very hard on connective tissue. A wide variety of grip, board heights, or rack heights can be used to work the bench like you have never worked it before. Weak at the top? Choke the bands over the TOP power-rack and then around the ends of the bar either before or after adding weight. Now the load is lighter on the bottom portion of the lift and will have almost whatever you put on the bar as far as weight goes at the top. This is an excellent way to help if your bench stalls midway or towards the top of the lift. Loop some heavy bands over the top of the rack and you can do a band style fly/crossover type movement. Loop them to the side of the rack and you can do heavy standing fly's. Wrap one over one palm of you hand, run it around you back and into the other palm and do band push-ups. Use heavy enough bands and the strongest lifter may get 1-2 reps?lol. These are a great finisher as long as the band tension isn't so high it becomes a core movement. You can also do dumbbell presses with a band looped around your back and the end of the band held in each hand. Lean down and grab the dumbbells and lift away. For low back work you can do band good-mornings, using just band weight and high reps as a finisher or for recovery work. Or with weight and band tension. Choke the bands around a dumbbell set on the ground that is heavy enough to anchor the band tension, then loop around the bar ends and have fun! Deadlifts can be done both lightened and tensioned. If your deadlift constantly stalls at knee level or higher, lightened dedlifts can be the bomb. They provide overload by allowing you to move a heavier load than you can break from the floor. I set mine up about 60 inches high in the rack and at that level I get a fair boost at floor level, but when I near knee level, and then pass it there is little, then ZERO band tension at lock-out. Unlike rack deadlifts there is a full range of motion so you are still pulling from the floor. This TENDS to provide a better carry-over then rack pulls from the knee level. Yes, the bands no disturb the groove quite a bit compared to a regular dead, but IMO, there is an easier transition going from heavy lightened deads to regular deads, than from rack-pulls to deads. They can be a lifesaver for people with "touchy" backs as you can vary the band tension and height of tension release almost infinitely. They can really teach you to drive with your legs when deadlifting. Many people use all back when pulling a regular dead. I have found lightening the weight in the lower portion of the lift, then SLOWLY adding weight (and/or lessening band tension) on the bottom teaches many to get good leg drive when pulling. If you are new to pulling, they make the movement less technically difficult. No, this is not an excuse to not learn good pulling technique, nor will lightened pulls teach you good regular pulling technique, but for a guy that has struggled for a long-time with the mechanics of pulling, they sure can make it a more natural feeling movement. A good rule is to not get too hog wild with the tension, just use enough to help break the floor and provide increased overload up top. Louis has discussed using band tension that makes a 135 lb barbell almost weightless on the floor. But he is using that with his 600-900 lb deadlifters. Adjust yours accordingly. To use bands for tensioned deadlifts you need a special deadlift platform that is sold by Jump-Stretch. They are about a 150 bucks and well worth it if you are a serious lifter. Upper back work with bands is da bomb. And lets start with those "heavy" guys, and newbies that can only do a few chins. Choke a band to the top of a power-rack. Put your feet in the band and guess what? At the bottom of the chin where you are weakest you will get a boost, and up top where you are strongest, there will be less assistance. These are FAR better than using a gravatron in my opinion. Band pull-downs are also awesome. Double a couple of bands over a power-rack or chin-up bar and run the open ends through your favorite lat handle, or even a strait piece of pipe for that matter. Pull-away! Cable rows with bands are another winner, and easy to do almost anywhere you can anchor a band. After I have done my heavy upper back work for the day, I often run two bands over the top of the power-rack and then lay on my back on a bench and do upside down rows. AWESOME finisher that will hit your whole upper back and bi's like you wouldn't believe. Speaking of bi's, run a band under heavy dumbbell and then take both ends and run them around the bends of an empty EZ-Curl bar. If you use the inner bends you will hold the bar in the traditional position, if you use the outer bends, hold with a narrow grip. Now pick up the bar and curl away. By backing away from the dumbbell you will find you can increase tension and..if the angle is enough you will find that unlike doing a weighted barbell curl, there is tons of tension in the peak contracted position. This has rapidly became my favorite bicep lift and strength gains using this method have been phenomenal. This also works with a straight bar, but band placement becomes critical to ensure tension is even. You can also just use a lat pull bar with the bands run through the carbiner. This assures even tension. Quads and hams are best hit doing THE classic band movement, band squats. Anchor one end of the bands with a dumbbell and wrap the other end over the bar. Add weight and SQUAT! Using too much band tension is not recommended although Joe Average (Jim Parrish's group) would likely disagree as Jim uses up to 50-60% band tension and squats 900. But for most people 15-35% band tension is a better bet, as they are EXTREMELY hard on the joints and CNS. Remember, once you are out of the hole doing a regular squat it gets easier as you complete the range of motion. With the bands as you move up to the contracted position the band tension increases. This makes for a MUCH harder squat. You can also run bands from the carriage of a hack squat machine or even leg press to any anchor point to accommodate resistance. The possibilities are endless and only limited by your creativity. You can also just loop a bend through you belt, stand on the open loops and add tension that way for quads/hams. For hams, about any way you can do a ham curl you can use bands for. They can also be used very effectively for pull-thrus. Just remember too much band work will over train you PRONTO. For big lifts, it's usually best to do them for no more than 3-4 weeks in a row. Accessory work such as bi's tri's, and delts can be done on a continual basis, but like anything else, variation is needed for continual progress. Don't get so caught up doing your new "favorite" band lift that you don't change it up when you need to.